Sept 24, 2011 - 6am Quezon City Hall "Smoke Free Philipiines" Fun Run, wear your sporty attire and chapter shirt. The Filipino-Chinese Dental Foundation, Inc will join the Bataan Medical Dental Outreach. 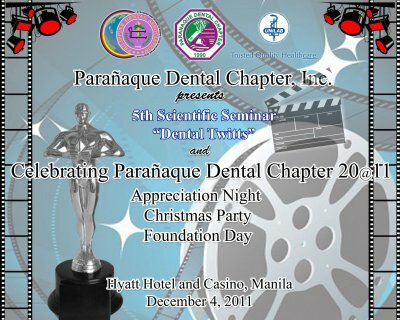 The North Davao Dental Chapter will be hosting this year's Philippine Dental Association Colgate Southern Mindanao Regional Conference this coming July 27, 2011 at Grand Menseng Hotel, Magallanes St., Davao City. Topics are Endodontics and Updates on Cosmetic Dentistry. The Philippine Dental Association Albay Chapter will be hosting the Philippine Dental Association Colgate Bicol Regional Conference on August 24 2011 at La Piazza Convention Center Tahao Road Legazpi City. The 1st Quezon Province Dental Chapter 3K & 5K Fun Run with Quezon Medical Center grounds as its Start & Finish venue will happen on JULY 17, 2011 at 5:00AM. Final briefing will start at 5:30AM followed by stretching exercises. Please be sure to have signed your Registration form & you have your Race Tag. Diagnostic Procedure for Dentin Hypersensitivity - Dr Francisco C Jimenez Jr. Your attendance is highly appreciated!